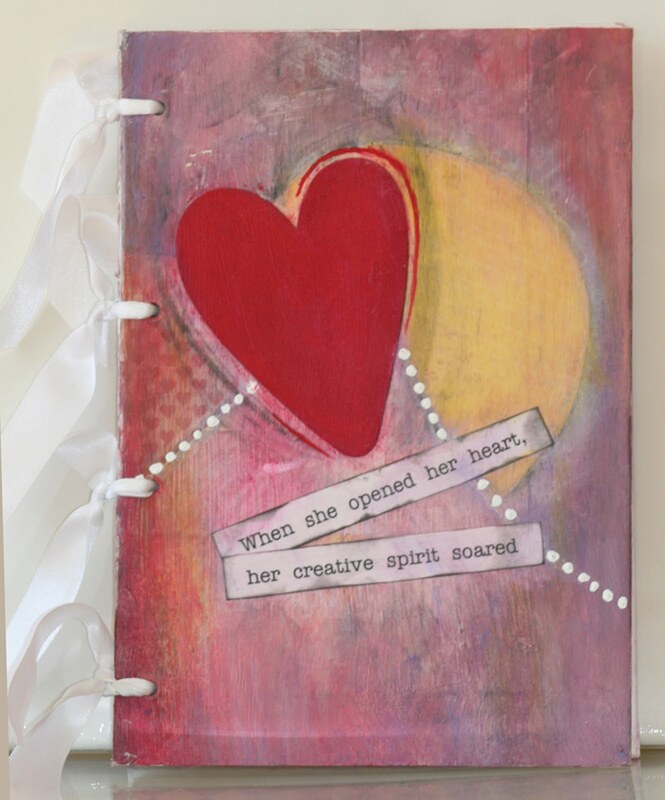 ﻿ I AM SO EXCITED - I FINISHED MY ART JOURNAL!!! I am working in my creative space, still in my bathrobe and it's 3:00 pm.- how sweet is that? The sun is bursting thru my window and filling my room with warmth. I can hear the little birds chirping outside my window and it brings a soft smile to my face. Once again, I realize how grateful I am for the little things in life. I was recently asked what my purpose was in writing this blog? The main reason is to openly journal the experience of my creative self emerging. I think it will also serve as a way of holding myself accountable. It is totally out of my comfort zone to be open about my feelings. I have always kept my deep feelings reserved. 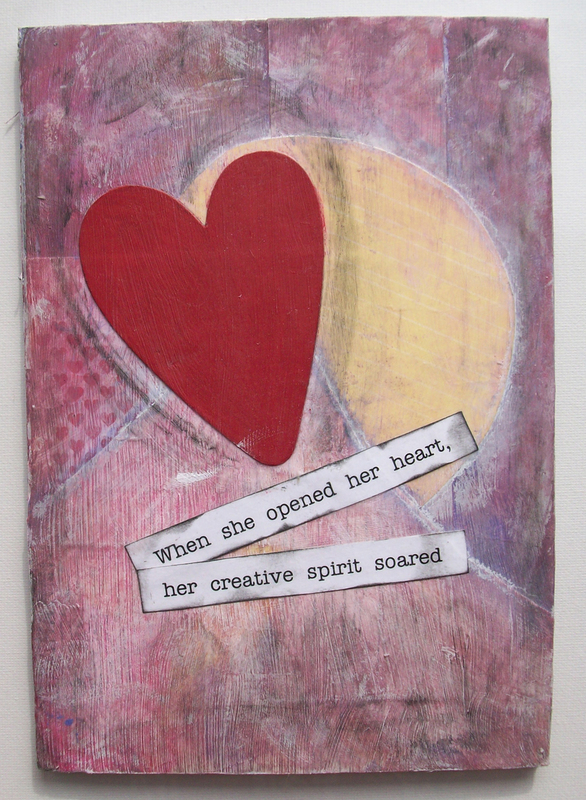 I do know that opening my heart will allow my creative spirit to soar. I am ready to " let it all go" and move forward toward expressing myself thru my art. So bear with me as I slowly take this BIG leap of faith into unfamiliar territory. Lately I have felt stuck. 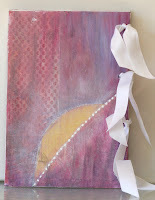 I have been spending time in my creative space, waiting for the inspiration to appear. Today I can feel myself moving from the ebb into the flow. Why? I believe it has something to do with an activity I did with Delaina, my grandaughter, today. Check out: http://www.weeheartmusic.com/ THANKS to Christy for inviting us! OK here I go! I am ready to "embrace change" and writing in this blog is a big one. Totally out of my comfort zone!! On mine & John's honeymoon in Sedona, AZ, my favorite place, I purchased a piece of canvas art by Kelly Rae Roberts, titled "What is calling you?" kellyraeroberts.com/shop/wall-decor/wall.../what-is-calling-you/ The piece spoke about the "whispers of our lives want us to take notice" and "we must hold their possibilities close to our chests and allow them to step into the light". Well, I literally looked at the picture and read the saying every day, sometimes more than once, even out loud. It seemed as if it was speaking right to me! Needless to say I have bought more of her art work since and I absolutley love the heartfelt and simple messages she delivers. On 1/11/11 I bought Kelly Rae Roberts book titled Taking Flight kellyraeroberts.com/book/ well....... that was the key that unlocked the door for my creative spirit. I have devoured every page, I almost ran out of ink in my highlighter. I was at the craft store, with the book in my hand, to buy some supplies when I felt this soft tug on my coat from a lady who exclaimed she had received the same book as a Christmas present. She (Christy) was at the craft store to get her supplies, too. How cool is that?!? We stood in the aisle for a while laughing and talking about giving our "creative spirit wings" and how excited we were to start painting. I'm not able to find the right words to explain how much it meant for me to meet Christy at the time I did. I just know that I felt like it was s message that I was on the right path. One of the jumping up and clicking your heels in the air moments!!!! 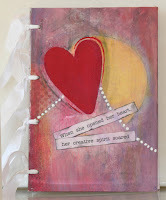 On 1/26/11 I started by first project from Taking Flight to create a art journal. I am posting the beginning of my journal. It just needs to be assembled. The reason it didn't get totally done is because I moved on to another project I made for my sister Bonnie.